Performers include: Will Arnett, Beau Bridges, Margo Martindale, J.B. Smoove, Jayma Mays, Nelson Franklin, and Eve Moon. 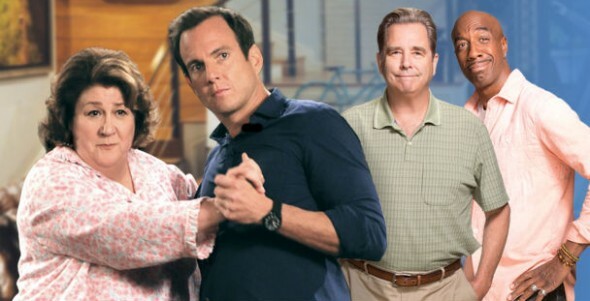 In this comedy series, Nathan Miller (Will Arnett) is a recent divorced local news reporter. He’s looking forward to living the life of a single man — until his parents’ marital problems unexpectedly derail his plans. After Nathan breaks the news of his divorce to his parents — Carol (Margo Martindale) and Tom Miller (Beau Bridges) — his father is inspired to follow his lead. He stuns his family when he leaves his wife of 43 years. Already in shock, Nathan is even more aghast when his vibrant but meddlesome mother decides to move in with him. Meanwhile, his absent-minded father decides to impose upon Nathan’s happily-married sister, Debbie (Jayma Mays), her husband Adam (Nelson Franklin), and their daughter Mikayla (Eve Moon). Ray (JB Smoove), Nathan’s best friend and news cameraman, was excited to be Nathan’s wingman in the dating scene, but Carol manages to even cramp his style. When Nathan decides he should have a better relationship with his niece Mikayla, he agrees to use his celebrity status to help Debbie and Adam get her into a popular school. Meanwhile, when Kip develops side effects from his sleeping pills, Carol and Tom agree to help him kick the habit by sleep-training him. First aired: July 18, 2015. What do you think? Do you like The Millers TV series? Do you think it should have been cancelled? Why do you think it didn’t survive long enough to see a third season? I LOVED the Millers!! Why or why did they have to take off the best show?? As a guy in his 60’s, I’ve seen my share of sit-coms. I first enjoyed Will Arnett in “Arrested Development” and Beau Bridges in “My Name is Earl”. Both series were funny and well acted and now defunct. It’s too bad that the programs I enjoyed the most have gone by the wayside. I’d like all the above sit-coms to make a comeback! We really enjoyed this show. We would laugh out loud at it. So sad that it was cancelled. HOW could this happen…. the new season is junk. Great show so funny….and it was replaced with garbage. The show was full of amazing talent! This is another TV show that should not have been cancelled. I get tired of the shows that are good being canceled. It happens all the time. I hope it will be on DVD so I can buy it! I just Loved this show. I wish it was still on.